Review: Wallis Annenberg Center for the Performing Arts & For The Record come together to bring audiences a thrilling evening celebrating the human experience of love . 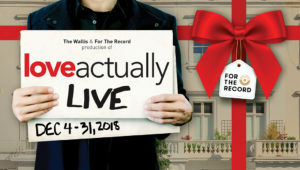 Love Actually Live is an exhilarating holiday treat running through December 31st. For The Record is known for turning blockbuster Hollywood films into musical theatrical experiences on stage. Tonight the hit movie Love Actually Live was transformed into a multi-media production. Adapted and directed by Anderson Davis, the staging is a clever juxtaposition of celluloid and theater. The movie is screened above the stage; with the cast acting, singing and dancing on platforms. Conductor Jesse Vargas and concertmaster Laurann Estevez enhanced the sound by splitting the positioning of musicians: strings in the orchestra pit and woodwinds, brass, percussion upstage. A lot is going on: an orchestra, screening of the film, actors playing out the scenes, support cast performing, entrances from the lobby down the aisles — a difficult task executed seamlessly. It must be a daunting challenge for the live actor to imitate roles created by movie greats such as Emma Thompson, Alan Rickman, Hugh Grant, Colin Firth, Liam Neeson and other famous stars of the film. Among the amalgamation, a few stood out. Rex Smith was superb in his portrayal of Billy Mack, the aging Rock Star. Tomasina Abate was noticeable the moment she hit the stage; presence and energy a real “thunder stealer.” She owned the character yet made the interpretation her own. The musical numbers, all 36 of them actually, are fantastic renditions sung by the live cast. “Puppy Love” (written by Paul Anka) was a great duo and trio. “The Trouble with Love is” (written by Kelly Clarkson) and “Jump” (written by Stephen Mitchell) were wonderful. It’s easy to sing along and move to the hit songs as some audience participation is welcomed. This is a good holiday evening out with family and friends. This performance was given on Saturday, December 15, 2018 at the Wallis Annenberg Center for the Performing Arts in Beverly Hills. For more information and tickets visit Wallis. The New Year’s Eve performance is a great way to start the new year!